MANILA, Philippines – Celebrity handler and TV host, Ogie Diaz used his own Facebook account to send a message to multi-level marketing personnel out there—better known as networking people. In a lengthy Facebook post on Monday, August 29, Diaz called on the networking people to think back and strategize more authentic ways to encourage their prospects in joining the business. Diaz specifically point a finger to those whom accumulated expensive cars like a Ferrari, Porche and Maserati to rather bring the vehicle’s registration proving the car is theirs, and not just a selfie picture beside the sports car. He also questioned if buying an expensive sports car is really a thing you’ll purchase or establish for yourself after gaining millions just to engage people and encourage them to join networking. Diaz advised that rather boast on expensive cars to your “prospect downlines,” choose to establish a house and lot, or a condo. He claims that a house and lot or a condo will be much more appreciated than an expensive car. To inspire prospect clients that they too can buy a home by joining. 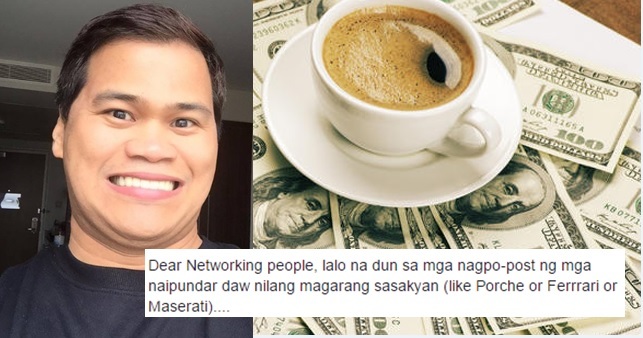 At please, tip lang sa ibang nagyayabang na yumaman sila sa networking lang, utang na loob, pag mag-iimbita kayo ng mga prospect, manlibre, kayo huwag sa coffee shop na kape lang ang iti-treat nyo. (And please, just a tip to those arrogant people claiming they got rich to networking alone, for goodness ‘sake, when inviting prospects, treat them and not just to a coffee shop where you’ll just buy them a lone coffee.) Ogie added. Diaz advised to bring prospects to a fine dining instead, wherein they can witness firsthand that the networker earned more through networking. The post went straight-up viral with more than 6,900 plus likes and 2,500 plus shares gaining funny but on point reactions from the netizens, clearly agreeing with Diaz. Multi-level marketing (MLM) better known as networking is spreading wildfire in the Philippines from known MLM companies to unregistered business in the country. One of the most popular networking ventures in the Philippines is network marketing. This includes beauty and health products like Avon, USANA, UNO, and DXN. Whereas, the success on networking is not always guaranteed. Last year, Senator Grace Poe has filed a resolution to call on "unscrupulous companies" that could lead the public into joining "bogus investment schemes and networking scams."